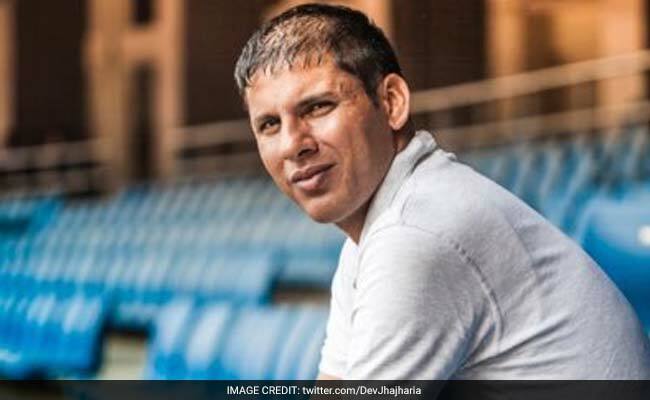 Devendra Jhajharia bettered his own world record to win gold in the javelin throw at Rio Paralympics. India's Devendra Jhajharia bettered his own world record to win gold in the men's javelin throw F46 event at the 2016 Rio Paralympics. Mr Jhajharia won gold in the javelin event at the 2004 Athens Paralympics with a record throw of 62.15 metres, becoming only the second gold medalist at the Paralympics for his country, and improved upon it with an attempt of 63.97 metres at the Olympic Stadium (Engenhao) here on Tuesday. The 36-year-old is currently ranked third in the world. Mr Jhajharia competed in the event alongside fellow Indians Rinku Hooda and Sundar Singh Gurjar. Rinku finished fifth with a personal best of 54.39 metres in six attempts, while Sundar Singh Gurjar didn't start the event. Mr Jhajharia took India's tally at this edition of the Paralympics to four medals -- two golds, one silver and a bronze. The Rajasthan born athlete, with an amputated left hand, was awarded the Arjuna award in 2004 and the Padma Shri in 2012, becoming the first Paralympian to receive the honour. He was electrocuted while climbing a tree when he was eight years old and his left hand had to be amputated. But that didn't deter him from pursuing his dreams. The track and field star won gold at the International Paralympic Committee's (IPC) Athletics World Championships in Lyon in 2013. He last participated in the Paralympics 12 years ago. The F46 event did not feature in the 2008 and the 2012 editions. Earlier on Tuesday, Ankur Dhama failed to qualify from the men's 1,500 m - T11 Round 1 event securing the 11th spot among 17 athletes, five among them getting disqualified. He took a time of 4:37.61 to finish his race but it wasn't enough as the first six qualified for the next round. Swimmer Suyash Jadhav couldn't qualify for the final round of the men's 200 metre Individual Medley competition. Jadhav trailed from the start and finished his heat sixth among as many swimmers with a time of 3 minute 1.05 seconds. The 22-year-old Maharashtrian was 10th in the overall standings among 12 swimmers. The best eight athletes progressed to the final round. Shot putter Deepa Malik on Monday confirmed India's third medal at the Paralympic Games. Deepa Malik bagged a silver medal in the women's shot-put F53 event, with a personal best throw of 4.61 metres. Mariyappan Thangavelu had won gold in the Men's High Jump T42 category on Friday with fellow Indian Varun Bhati taking bronze at the same event. Deepa also became the first Indian female medalist in the history of the Paralympic Games. India, who made their Paralympic Games debut in 1968, have bagged a total of 12 medals including four golds, four silvers and an equal number of bronze medals. Britain also set two world records at the Rio Paralympics on Tuesday. Georgie Hermitage added 400m gold to her 100m title as she stormed to T37 victory in a new world mark of 1.00.43. Elsewhere teammate Hollie Arnold won F46 javelin gold with a 43.01m world record throw.